Every effort must be taken to reduce personnel exposure to waste anesthetic gases. 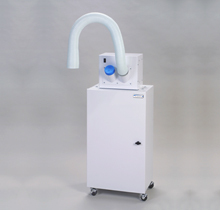 These self-contained recirculating air-cleaning systems capture air contaminants directly at the source, safely remove them, and then release clean air back into the room. Two self-supported, articulating extractor arms, which can be flared at one end to make a "hood" up to 4.5" in diameter or decreased to make a nozzle as small as 2.0" in diameter. Each arm's reach is expandable up to 48" in length. Low noise level - 100,000-hour motor life (typical) - Heavy-duty 14-gauge construction. Item Number: 933101 - Comes with two sets of mounting brackets to attach easily to table or bench top, with primary stage filter extending above or below. Item Number: 933105 - The portability of this system makes it ideal to use in hard to reach places and for moving between locations. The primary stage filter is located inside the cabinet. 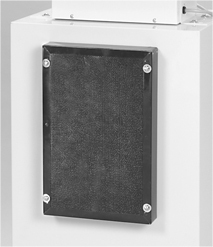 This model also accepts an optional secondary activated carbon, refillable adsorption module. 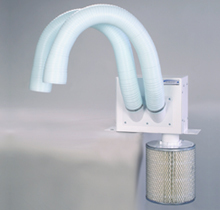 Item Number: High-capacity adsorption filter. Refillable with activated carbon. For use with 933105.